Business procedures range from printing of invoices to scanning of order slips and in this respect, multifunctional devices that provide ease of use offer an advantage and 2 of these are featured in the Samsung MultiXpress A3 Color Multifunctional Printers review. These are the first A3 color printers offered by this brand. To come up with these printers, the company merges their long time experience in business printing and consumer electronics industry. After years in the making plus severe testing in terms of quality of design and performance, Samsung presents A3 printing at its best with devices that are sure to impress their users. Samsung’s A3 printers come with a modular design that can be made to conform to a user’s different requirements. So, anytime you need to, you can adjust the basic configuration so that you can make use of a fax option, you can add extra trays or a finisher and even utilize a booklet maker. In addition to this, you can use the brand’s open development platform to customize the user interface. These printers are extremely simple to use and maintain with their wide touchscreen LCD display that lets a user navigate, smoothly, through printer menu and functions. This allows him to plan even the most complex jobs in copying. It, likewise, lets you simplify jobs by creating shortcuts. These devices’ control panel enables one to choose options that make you save on costs of printing and energy. The brand’s award-winning software makes it simple to manage several multifunctional devices on the network via a web interface. Toner cartridges that need to be replaced are, also, easy to reach so you can rely less on servicing. This reduces printer’s downtime. These MultiXpress devices deliver high speeds in 4 functions of printing, copying, scanning, faxing and present flexible handling of media, making them the ultimate workgroup all-in-one color printers. They support an assortment of large and heavy media forms and sizes and they come in different finishing options to give output, a more professional look. Exceptionally large capacity trays enable long prints without interruption that is brought about by regular reloading of paper while an automatic document feeder lets you leave printer functions unattended to focus on other tasks. They are equipped with built-in high level, security features that protect classified data from unauthorized printer users. With them, documents are secured with enhanced measures such as encryption, PIN , passwords, watermarks, stamps, tags and overwrite options. Samsung MultiXpress CLX-9250ND measures 26.67” W x 30.04” D x 36.53” H. It makes use of an 8.9” color touchscreen LCD display. It prints and copies at 25 pages per minute for both mono and color with a resolution of 2400 x 600 dpi. It prints its first page in 12.5 seconds for mono and 13.5 seconds for color. Its first page is copied in 9.5 seconds for mono and 10.5 seconds for color. It allows the following copy features: 9,999 multi copies, Quick Copy, Proof Copy, ID copy, Poster copy, Booklet copy, Book copy, N-up copy, enlargement up to 400%, reduction down to 25% and others. It scans copies at 60 images per minute for both mono and color, with a resolution of 600 x 600 dpi, which can be enhanced up to 4800 x 4800 dpi. It enables scanning to PC, an email, a USB and network folders. This device lets you scan previews to avoid errors. It makes use of a super G3 fax, which gives a speed of 33.6 kbps. It supports Auto-Dial and has the fax features such as Speed Dial, Auto Redial, Group Dial, Caller ID and Fax Forwarding, among others. It comes with 2 trays of 520 sheets each and a multipurpose tray of 100 sheets. As a result it has a maximum tray of 1140 sheets. It can hold an assortment of media forms like bond paper, color paper, recycled paper, pre-printed paper, letterhead paper, index cards, stock cards and transparencies. Its multipurpose tray has a capacity for 10 pieces of envelopes. It supports media sizes of 5.83” x 8.27” to 12” x 18” (standard tray) / 3.86 “x 5.83” to 12.6” x 18” (multipurpose tray). 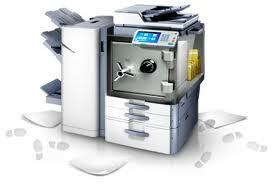 It has an automatic document feeder (ADF) that is capable of 100 sheets. This supports media sizes of A3, A4, A5, B4 and B5. Samsung MultiXpress CLX-9350ND measures 26.67” W x 30.04” D x 36.53” H and as an 8.9” touchscreed LCD display. It prints and copies at 35 pages per minute for both mono and color with a resolution of 2400 x 600 dpi. Its first page prints in 9.5 seconds in mono and 10.5 seconds in color. It copies its first page in 7.5 seconds in mono and 8.5 seconds in color. It has the same copy, scan and fax features as the CLX-9250ND. Samsung MultiXpress CLX-9250ND and CLX-9350ND are the new all-in-one A3 printers that are designed to boost productivity in any workplace. They provide user-friendly features, like a wide touchscreen LCD display to navigate through printer functions and the brand’s award-winning software that gives easy management of other all-in-one printers on the network. They deliver high speeds from the very first page and have print, copy, scan and fax features that can be relied on to perform office tasks. Flexible paper handling such as extremely large paper tray capacities, the capability to support different media forms and sizes and an automatic document feeder improves efficiency of workgroups. All these are vital in producing output in large format such as worksheets and A4 booklets, to name a few. Businesses can rest assured that their confidential data is protected with these devices' built-in security network plus their security features in the form of a PIN or a password. These give you full control over the use of these devices. This may be Samsung’s initial offering in this category, nevertheless, the company has made it a point to have it strictly tested with regards to quality, dependability, efficiency and serviceability. As a result, these printers have been enhanced to give impressive results. As a matter of fact, they have earned an award from the Buyers Laboratoy Inc, a prominent independent testing organization, for their quality of design and performance. All these are evident in this Samsung MultiXpress A3 Color Multifunctional Printers review. Simply click here to return to Photo Printer Reviews.